Halo: Warfleet – An Illustrated Guide to the Spacecraft of Halo is a reference book on the Halo universe that was released on September 5, 2017. The book details the technology, scale, design, construction, and variety of ships, space stations, and colony worlds in the Halo universe. “ From the developers of the Halo video game franchise comes an official guide to the spacecrafts of the Halo universe, featuring intricately detailed cross-section illustrations. This is the official, authoritative guide to the spacecrafts of the Halo universe, written in collaboration with 343 Industries, the developers of the “Halo” franchise. The full-color illustrated package covers the fleets of the UNSC, Covenant, and the Forerunner factions, featuring intricately detailed cross-section illustrations of franchise favorites the Pillar of Autumn, High Charity, and the Forerunner Dreadnought. Other specialized spreads offer a closer look at the weapons used in space, the planets of the Covenant and Human colonies, and the space-faring technology that each utilize. With illustrations from the Halo team and renowned illustrator Isaac Hannaford, this is a must-have for fans of the Halo franchise. 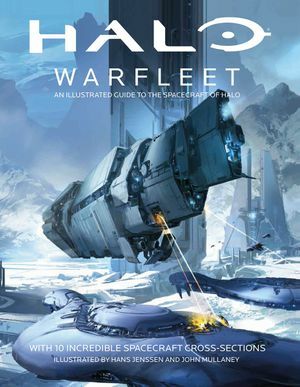 Described as a more "technical" counterpart to Halo Mythos, Halo: Warfleet features ten full-color cross-sections of ships by Hans Jenssen, known for his work on Star Wars: Incredible Cross-Sections, and John Mullaney, who previously worked on ship cross-sections based on the Firefly franchise. In addition, multiple all-new secondary art pieces by various artists are included. Written by 343 Industries' internal writing team, with Kenneth Peters serving as writing lead, Warfleet also includes a variety of specific technical details and terminology formerly contained to the Halo Story Bible. The book is divided into five sections: Introduction/Technical Architecture, Human Ships, Covenant Ships, Forerunner Ships, as well as an expansive Glossary. The book is published in an "oversized" format to accommodate the detail in the larger illustrations. Each spread includes annotations to explain the functions of given parts of a ship, along with statistics and history of the vehicle in question. Halo: Warfleet was announced on the Halo website in an issue of the Halo Community Update on October 14, 2016. An earlier version of the book's cover. Early version of the Gladius-class corvette. The book's full cover illustration. A cutaway illustration of the Shadow of intent. The Halcyon-class light cruiser on the book's cover is based on the original depiction of the class seen in Halo: Combat Evolved (including the Marathon logo on the port side) rather than the updated model seen in Halo: Reach and later media.